At age 102, comic Irving Benson stood alone as the oldest link to a uniquely American art form - Burlesque. For more than half a century, Irv was a “first comic." He was the contemporary of great funny-men like Abbott & Costello, Red Skelton, Phil Silvers, and Jackie Gleason. Irving headlines a cast of fellow veteran Burlesque and Vaudeville performers. Together with a team of theatre historians, they uncover the roots of American comedy and take us inside the colorful world of the Burlesque show. The Last First Comic also spotlights the final film appearance of legendary straight man Ed McMahon from the Tonight Show with Johnny Carson on NBC Television. 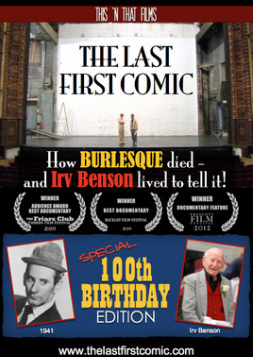 Filmed on location in NYC's Palace Theatre, The Last First Comic showcases hilarious footage of Irv's classic Burlesque routines with stars like Milton Berle and Johnny Carson. Explore a dynamic chapter in the history of our country and its popular entertainment. Celebrate a life well lived - both onstage and off.